It was in 2001 that David Wain first introduced us to the comedic cult family of characters in his feature film Wet Hot American Summer. Now, almost a decade and a half later he has struck a deal with Netflix, filming has reportedly begun on the project and most of the original cast is set to return. According to Deadline, the 8-episode limited series will be based on the original film and will feature the cast (presumably in their original roles), almost in its entirety. That in itself should have fans of the pre-existing film salivating but let’s look a little bit closer as to who exactly has been confirmed for the project. *The following actors/actresses have all been confirmed for the project. It is presumed they will return as their original characters. Elizabeth Banks originally played the role of Lindsay. Michael Ian Black originally played the shorty shorts-wearing McKinley. Bradley Cooper originally filled the shoes of Ben. Will we see more of the McKinley bromance? One can only hope! Judah Friedlander originally played the role of Ron von Kleinenstein. Janeane Garofalo originally played the role of Beth. Nina Hellman originally played Nancy. Ken Marino originally played Victor Kulak. Let’s hope he will bring his iconic afro back with him. Zak Orth originally played J.J.
David Hyde Pierce originally played the role of Henry Newman. Joe LoTruglio originally played the thick spectacle-wearing Neil. Christopher Meloni originally played camp chef Gene. A.D. Miles originally played the role of Gary. Marguerite Moreau originally played Katie. Amy Poehler originally filled the shoes of Susie. Paul Rudd originally filled the role of Andy. Marisa Ryan originally played Abby Bernstein. Molly Shannon originally played the role of Gail von Keinentein. Michael Showalter originally played both Gerald ‘Coop’ Cooperberg and Alan Shemper. Kevin Sussman originally filled the role of Steve. Wain and Showalter, who together wrote the script for the original Wet Hot American Summer, will take on duties as the limited series’ creators, with Wain set to reprise his role as director. The duo will be executive producing the prequel series, alongside Howard Bernstein, Jonathan Stern and Peter Principato. 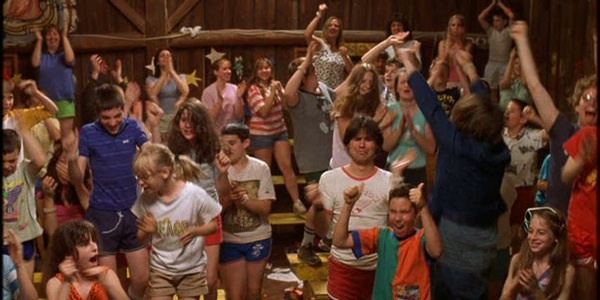 Wet Hot American Summer follows a group of counselors as they try to take care of unfinished business on their last day of Jewish summer camp. While not a box office hit, the film gathered a cult following on the home-viewing market. Many of the cast have gone on to have extremely successful careers, most notably Bradley Cooper (Wedding Crashers, Silver Linings Playbook), Amy Poehler (Parks and Recreation) and Paul Rudd (Role Models), the latter two whom co-starred in Wain’s most recent feature They Came Together. Michael Ian Black (The Gaffigan Show), Ken Marino (Marry Me, Togetherness) and Joe Lo Truglio (Brooklyn Nine-Nine) have also been gaining traction in recent years. This isn’t the first time the cast has reunited. In August of 2011 many of them gathered at the Music Hall of Williamsburg in Brooklyn to celebrate the movie’s 10th anniversary. The original cast also pulled together in January of 2012 to perform at the San Francisco Sketchfest for a live radio play version of the film. See the trailer for the original film below.